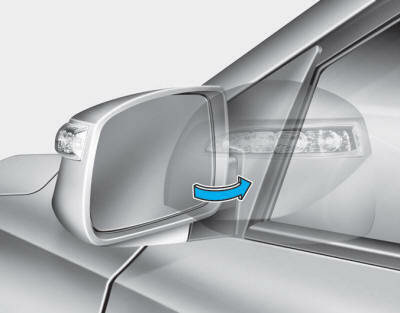 Your vehicle is equipped with both lefthand and right-hand outside mirrors. Use your interior rearview mirror or turn your head and look to determine the actual distance of following vehicles when changing lanes. Do not adjust or fold the outside rearview mirrors while driving. This may cause loss of vehicle control resulting in an accident. Do not scrape ice off the mirror face; this may damage the surface of the glass. If the mirror is jammed with ice, do not adjust the mirror by force. Use an approved de-icer (not radiator antifreeze) spray, or a sponge or soft cloth with very warm water, or move the vehicle to a warm place and allow the ice to melt. Press either the L (driver’s side) or R (passenger’s side) button (1) to select the rearview mirror you would like to adjust. 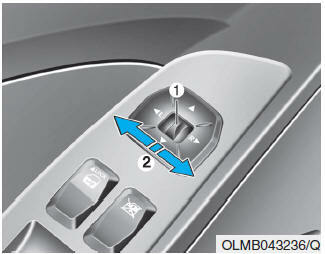 Use the mirror adjustment control (2) to position the selected mirror up, down, left or right. After adjustment, press the L or R button (1) again to prevent inadvertent adjustment. The mirrors stop moving when they reach the maximum adjusting angles, but the motor continues to operate while the switch is pressed. Do not press the switch longer than necessary; the motor may be damaged. 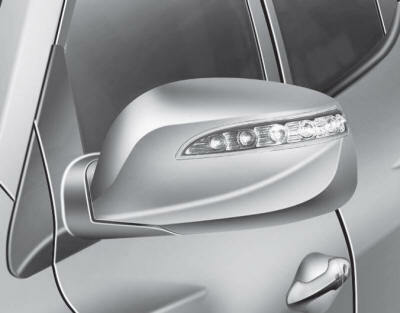 Do not attempt to adjust the outside rearview mirror by hand or the motor may be damaged.